House Speaker Joe Aresimowicz and Minority Leader Themis Klarides. Legislators are hoping this spring’s $1.2 billion surge in income tax receipts was not a one-time event. But even if analysts project Monday that some fraction of that revenue surge recurs next fiscal year, the prospects for a new budget deal before the session ends on May 9 hinge on lawmakers’ solving several partisan conflicts. Democrats and Republicans disagree about emergency aid for Hartford, pension funding, higher education, overall spending levels and a new “volatility” cap that makes it hard to spend surplus income tax receipts. “I think last year the spirit of cooperation and bipartisanship didn’t come until after the governor’s veto,” House Speaker Joe Aresimowicz, D-Berlin said, referring to a September veto by Gov. Dannel P. Malloy of a GOP-sponsored budget that passed with modest Democratic support. Last year’s marathon budget debate stretched from February, past the end of the regular legislative session in early June, and on through the end of October. But legislators want to wrap up business on time in 2018, since it is a state election year and most will spend the summer and fall running for office. What are some of those common budget issues? Both parties want to mitigate previously ordered cuts to the Medicare Savings Program, which helps poor seniors and disabled patients pay for medications. The cutbacks scheduled to kick in July 1 could reduce benefits for more than 113,000 patients. Democrats and Republicans alike want to send some extra dollars to cities and towns. Malloy reduced municipal grants by more than $90 million this fiscal year to achieve budgetary savings targets mandated by the legislature. And both parties also have said they want to close a projected deficit in the preliminary budget for the 2018-19 fiscal year. Technically that potential shortfall is about $115 million. But effectively it is closer to $265 million. Legislators learned earlier this month that federal approval for a new hospital taxing arrangement probably won’t come — as originally anticipated — before the fiscal year ends on June 30, but now is expected later in the summer or fall. That simply creates an accounting problem, creating a $150 million problem in the outgoing fiscal year, and adding $150 million in resources to 2018-19. In past years, all of these problems would be solved when the state’s coffers benefitted from as robust an April income tax season as they experienced this year. Preliminary estimates from the legislature’s nonpartisan Office of Fiscal Analysis (OFA) and the Department of Revenue Services are that income tax receipts from quarterly filings — most of which involve capital gains and other investment earnings — will finish $1.2 billion above projections this fiscal year. A consensus revenue report due Monday from OFA and from the governor’s budget office will determine if any portion of this $1.2 billion surge is likely to recur next spring. Many households inflated their quarterly state income tax payment in December to take advantage of favorable federal income tax rules that expired after the 2017 calendar year. And a federal income tax loophole that for years allowed hedge-fund managers to accumulate offshore gains without paying federal and and state income taxes closed this year, leading to a one-time surge in payments. But regardless of whether Connecticut’s revenue surge repeats or not, a new volatility cap prohibits legislators from immediately spending this funds, requiring instead that they be deposited in the budget reserve, commonly known as the rainy day fund. The legislature could carve out an exception and tap those funds early, but it probably would take agreement by both parties. Democrats hold a slim 79-71 edge in the House while the Senate is split 18-18. Republicans say Democrats must want to tap these funds, noting the Democrats’ proposed adjustments for the next state budget exceed the last revenue forecast for 2018-19 by about $375 million. Democrats counter that the GOP plan short-changes higher education. It would cut the the University of Connecticut by 11 percent and the UConn Health Center by 15 percent. The state’s other public college system, which includes the four regional state universities and 12 community colleges, would lose 5 percent under the Republican plan. The GOP also would rely, in part, on the April income tax bonanza and the disputed tactic of cutting labor costs a decade down the road but claiming the savings now. Republicans would deposit two-thirds of the $1.2 billion surge in income tax receipts into the state’s two, cash-starved pension funds. But they also would reduce the original base payments into those funds by a total of $40 million. The proposal to cut labor costs now by reducing benefits in 2027 is not a new one. A similar plan from the GOP drew strong Democratic opposition last year. Specifically, Republicans proposed restricting state employee pension benefits starting in mid-2027 — after the current contract expires — but reaping almost $62 million in savings now. Democratic legislators, Malloy and union leaders all have called this strategy illegal. And then there’s the matter of Hartford. Republican legislators — and some Democrats — were frustrated to learn recently that the city and the Malloy administration had reached an agreement to pay off Hartford’s general obligation debt. 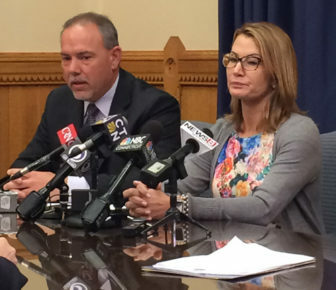 Connecticut would pay off the city’s $534 million in outstanding bonded debt and an undetermined amout of interest. The state is expected to retire this over 20 to 30 years, depending on how Hartford officials renegotiate their obligations with bondholders. Interest charges also will depend on those negotiations. Legislators ordered assistance for Hartford last October as part of a new state budget deal, but many assert the agreement went beyond what lawmakers authorized. The Republican budget proposed reducing future traditional state grants to Hartford each year after 2018-19 to match any debt assistance provided under the new agreement — effectively neutralizing the value of that aid.